There are many destinations that are hailed as Melbourne's coolest, but the Chill On Ice Lounge unquestionably takes the title. A bar like no other, it is filled with intricate sculptures made of ice and kept at a glacial ten degrees below zero. Despite being housed in the Southgate Shopping Complex, Chill On is its own frosty little world away from the hustle and bustle of busy shoppers. Even looking out of the Ice Lounge windows feels surreal. As you're surrounded by crystal-clear ice and sub-zero temperature, outdoors sunlight is glinting off the Yarra River and roving street entertainers play with fire. Every six months, a new theme is crafted and ice sculptures made accordingly. When I went, the theme was Creatures of the Deep. A deep-sea diver, Neptune with his sceptre, and a miscellany of sea creatures populate the Lounge. Altogether, there are about fifty tonnes of ice used to make the detailed sculptures. The Chill On Ice Lounge is filled with fifty tonnes worth of intricate ice sculptures. Almost everything in the Ice Lounge is made from ice, even the glasses that drinks are served in. There are tables and stools to relax on, but you wouldn't want to sit for long because they too are made of ice. The drinks at Chill On are deliciously different. Cocktails on offer include the orange choc shock and the icy colada. A selection of shots, including concoctions such as cherry ripe (which tasted like a real cherry ripe, in liquid form) and the frozen mexican. If you're looking to ward off the cold, try a toasty warm espresso shot. All cocktails are $15, and shots are $10. For the kids and non-drinkers, there are $5 fruity mocktails available including winter berry and banana rama. The full drinks list can be viewed here. 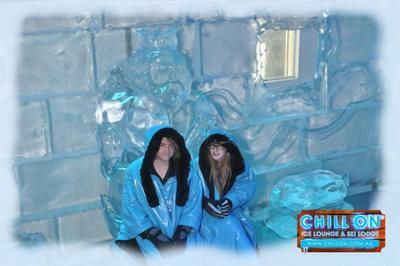 Before entering the Ice Lounge, you need to put on the bulky poncho and gloves provided. A word of warning, the poncho does not cover your legs - so you would be very brave to wear a skirt or shorts during your Chill On Ice experience. Despite being literally freezing in the Ice Lounge, it does not actually feel that cold. I was expecting to be shivering and uncomfortable, but found it to be quite bearable underneath that poncho. Anyone who survives the entire thirty minutes in the Ice Lounge is photographed with the photo uploaded to Chill On's Facebook page - but it's not much of a feat if you're rugged up. Keeping warm under a huge poncho at the Ice Lounge. After enduring the freezing conditions of the Ice Lounge, the Ski Lodge is the perfect setting to warm up over some delicious food. While they specialise in tapas dishes, salads and cheese platters are also available. The full menu can be viewed here. 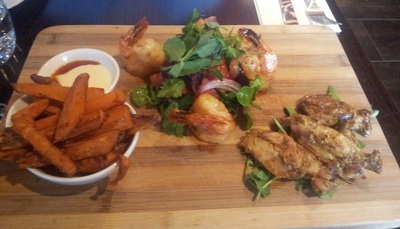 My partner and I enjoyed a tapas plate with prawns and salad, chicken riblettes and sweet potato chips. Everything was flavourful and succulent, and the portion sizes were perfect for two to snack on. The wait for food was surprisingly short - it took under ten minutes after being seated for our tapas plate to arrive. A delicious tapas plate from the Ski Lodge was the perfect warmer after half an hour in the Ice Lounge. As the Ice Lounge has a capacity of only fifty people, it is advisable to book your visit ahead of time here. Standard admission, which includes half an hour in the Ice Lounge and a cocktail, is $30 per adult. Deluxe admission, which includes a cocktail and a shot during your half hour Ice Lounge experience, is $40. Or, go all out with $50 premium admission, which also includes a photo of you taken on one of the Ice Lounge cameras. Seperately, photos cost $15 each (cameras cannot be brought into the Ice Lounge). Children's admission, which includes a fruity drink when in the Ice Lounge, is $15 per child. 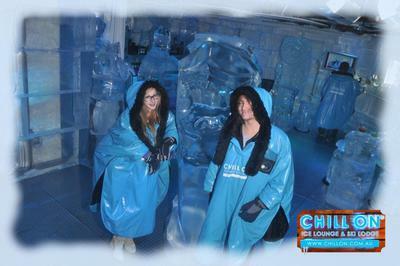 The Chill On Ice Lounge is a truly different experience, unlike any other in Melbourne or even Australia. Highly recommended for tourists and locals alike. Natasha's visit was courtesy of Chill On Ice Lounge. Why? Because it's the coolest place to be in Melbourne. When: 10am to 11pm Sunday - Thursday, 10am - 1am Friday- Saturday. Where: Southgate Complex (mid level), 3 Southgate Avenue, Southbank. Cost: From $30 per adult, $15 per child. I bet you needed a couple of cocktails to warm up after that! great article Natasha! been there and loved it. their cocktails are quite enticing! I never thought the Ice Lounge would be that interesting. You really instilled a bit of warmth into a chilly experience.